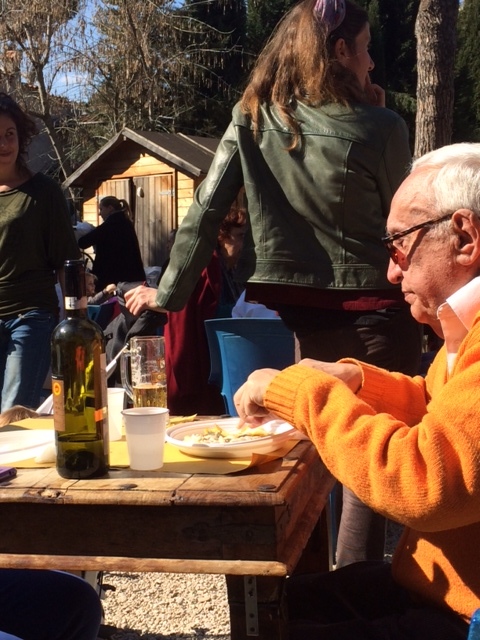 Pranzo Sociale – prezzo popolare. These four words are music to my ears. It is loosely translated as a cheap & delicious lunch. Popolare derives from the word popolo, which means people, in the sense of a community. Un pranzo sociale ad un prezzo popolare is not only a lunch, but an opportunity for members of the community to get together to eat well at a good price. 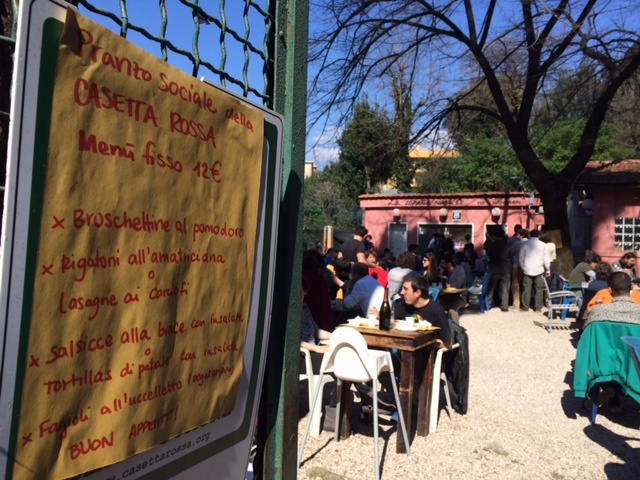 When I saw the notice from La Casetta Rossa for a Sunday pranzo sociale, I knew that it was something not to be missed. 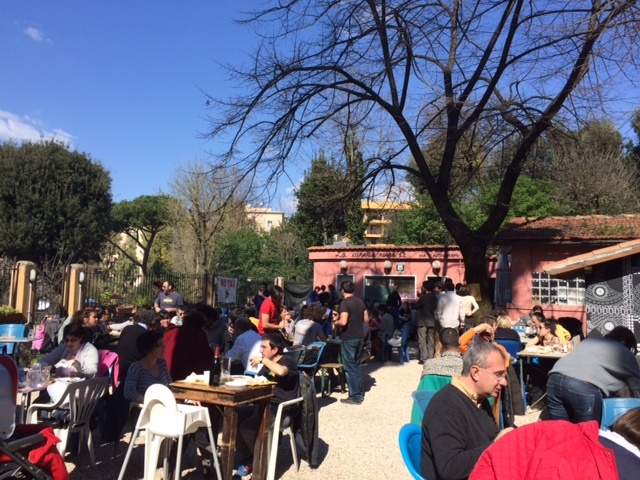 La Casetta Rossa is located in the Garbatella neighborhood of Rome. The little red house, was formerly an abandoned building that has been morphed into a restaurant, pub, and a sort of community center. 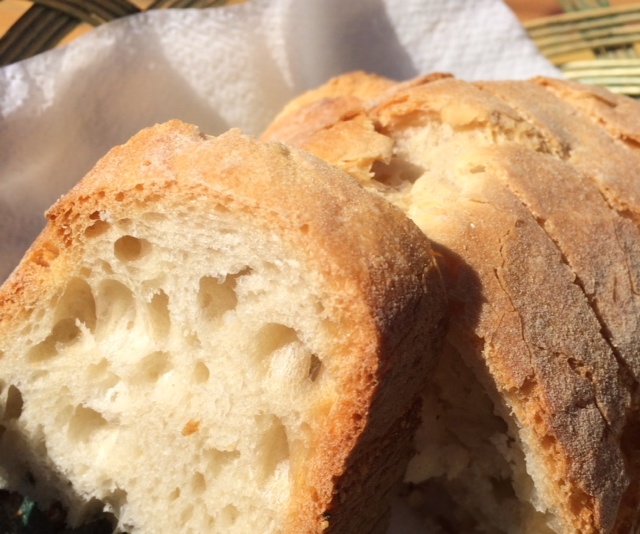 It is a kilometer-zero kitchen, meaning all of the products are local and of course, seasonal. 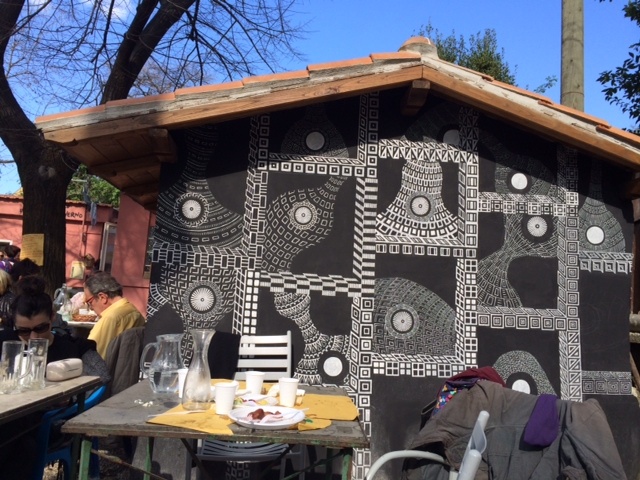 In addition to serving delicious food and wine and reasonable prices, there are also language exchange happy hours, pizza/bread making lessons, as well as the possibility to bake your own bread in the Casetta’s wood burning forno popolare (seen below with the black and white designs),to name only a few of the additional services offered. We arrived early knowing that it would be a standing room only situation on a beautiful, warm, sunny Sunday. 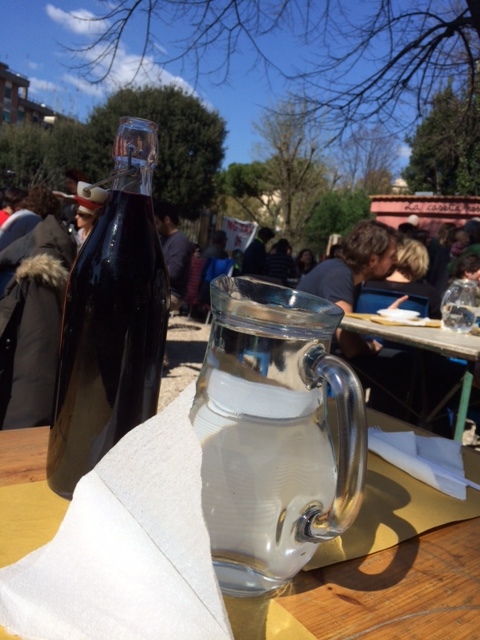 There were tables set up out in the garden and we were lucky to snag two seats at a long communal table. The menu was fixed with two choices – vegetarian or meat based plates. I opted for meat when I saw rigatoni all’amatriciana on the menu. 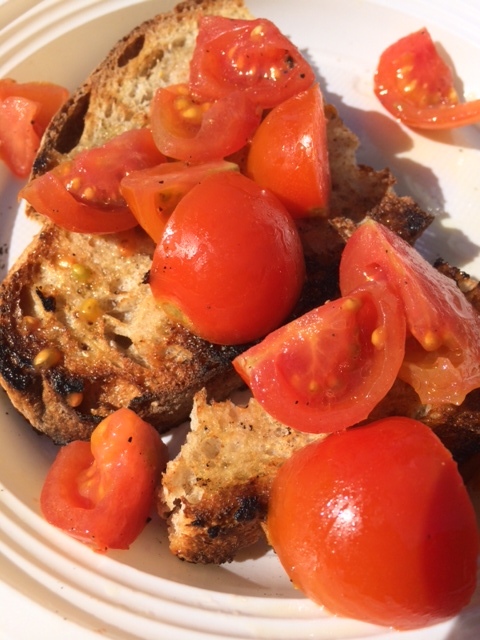 The starter was a bruschettina al pomodoro, made with bread baked in the forno popolare , and delicious, sweet cherry tomatoes and locally produced olive oil. 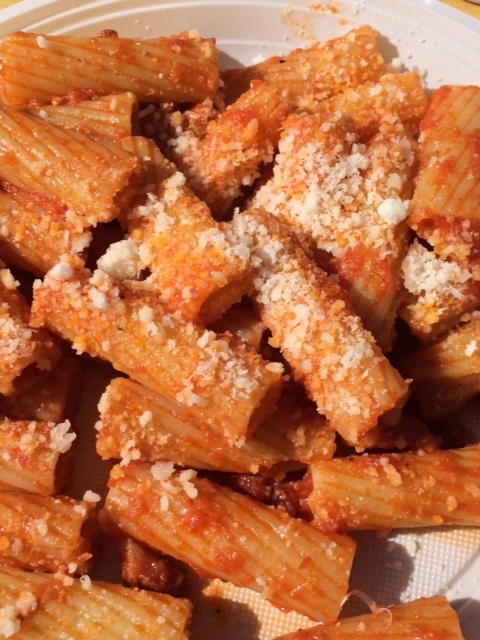 The primo piatto was the rigatoni all’amatriciana I previously mentioned. 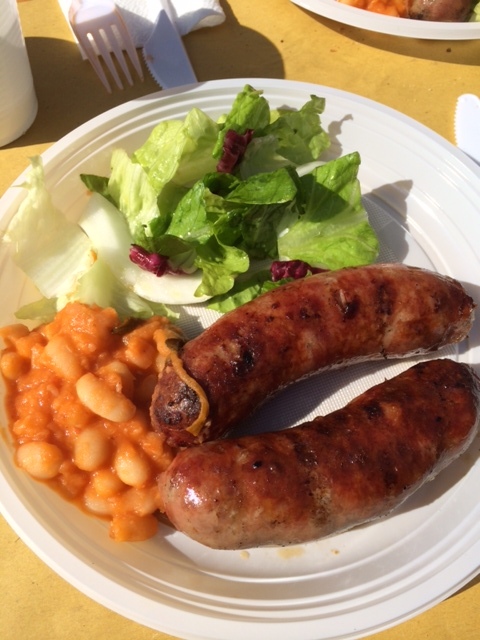 The secondo consisted of 2 grilled pork sausages, salad, and fagioli all’uccelletto (white beans in a sage & tomato sauce). All of these goodies – just 12 euro! Drinks were extra, but still reasonably priced. We added a liter of red wine for 5 euro. The day was beautiful and the garden was filled with people of all ages. 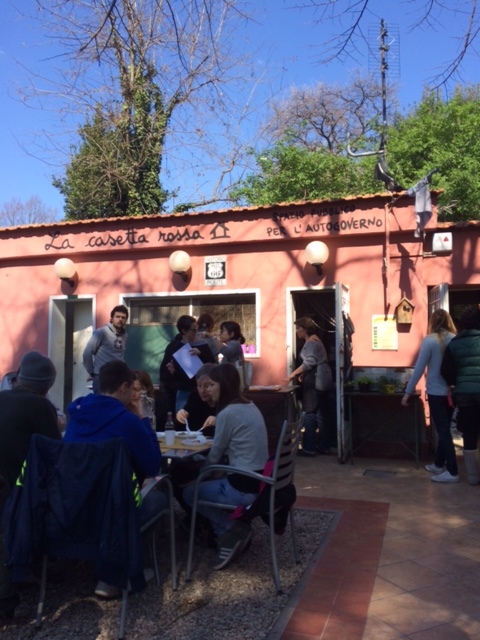 La Casetta Rossa is a friendly environment with good quality food in a unique setting. 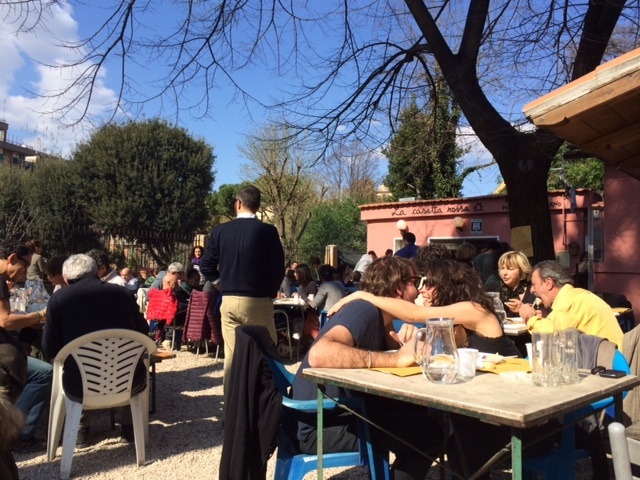 It is a great place for lunch, dinner, or even an aperitivo. I always feel at home here. Thanks Amy! I hope you can come visit soon! We would love to show you around!